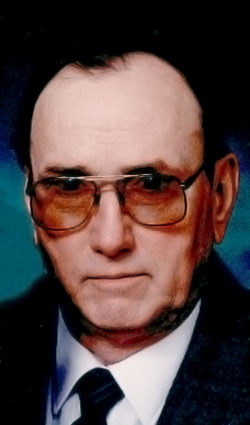 Roman G. Hillesheim, 89, of Sleepy Eye died on Monday, September 5, 2011, at Sleepy Eye Medical Center. Visitation will be at Sturm Funeral Home, Sleepy Eye, on Thursday from 4 to 8 p.m. and on Friday from 7:30 to 10 a.m. There will be a parish prayer service at 7 p.m. Thursday at the funeral home. Service will be held at St. Mary's Catholic Church, Sleepy Eye, on Friday, September 9, 2011, at 10:30 a.m. The Clergy will be Msgr. Eugene Lozinski. Interment St. Mary's Catholic Cemetery Arrangements are with the Sturm Funeral Home in Sleepy Eye. Roman was born to Frank & Catherine (Goblirsch) Hillesheim on March 12, 1922, in Stark Township. On Oct. 12, 1943, he was united in marriage to Angela Huiras. After marriage he drove bulk truck for Brown County Oil and later farmed in Stark Township. Angela passed away on Jan. 31, 1994. In October 1995, he married Marlee (Gulden) Huiras. Roman enjoyed playing cards, entertaining with his concertina, was an excellent metal and woodworking craftsman and was especially proud of serving as caretaker of the Iberia Cemetery. (Walter) and Angie (Leslie) Hillesheim; and brothers-in-law, Ray Roiger and Walter Groebner.